Robert Atwell, part-owner of The Druids Nephew, admits there are a lot of nerves ahead of Saturday's Grand National at Aintree. The eight-year-old is among the favourites in the 39-strong field. "It is the classic case of looking relaxed and paddling like mad underneath," Atwell told BBC Wiltshire. "I read all the articles in the paper, the things on television, BBC radio come around and it really lets you know what you are letting yourself in for." 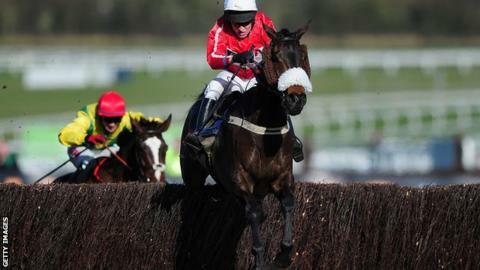 The Druids Nephew gave trainer Neil Mulholland his first ever Cheltenham Festival win in March, a performance that strengthened hopes of success at Aintree. Aidan Coleman deputises for injured jockey Barry Geraghty on Saturday. "You hope to win, but your main hope is that he comes home fit and well," said Atwell. "He wouldn't be doing it if the fences were as they were some years ago, but they have been improved so much. "It is worrying because you have this lovely, relaxed animal and suddenly you are in this enormous amphitheatre of hustle, bustle, horses, jockeys and everything going on.